Drivesmart 61 version 6.0 is available via Garmin Express. Added support for the new Garmin BC 40 Wireless Backup Camera. Improved the reliability of connections to Bluetooth devices. Fixed an issue that caused some spoken words to be mispronounced. Update appears to require GE be updated to 6.13.1.0 in order to install the GPS software update. I've seen this reference before, I think it was with the new 65 models, can anyone tell me what the significance is please? Nevermind, I found this informative article on the subject, thanks. I've updated my DS61, is there a setting somewhere to tell it to use the Galileo satellites, or is it automatic? I remember in my old GPS's you were able to choose a "GPS mode"
I read somewhere that the satellites icons shown on the satellite page display the Galileo satellites in a different color. Can't prove it as they only appear for EU folks. 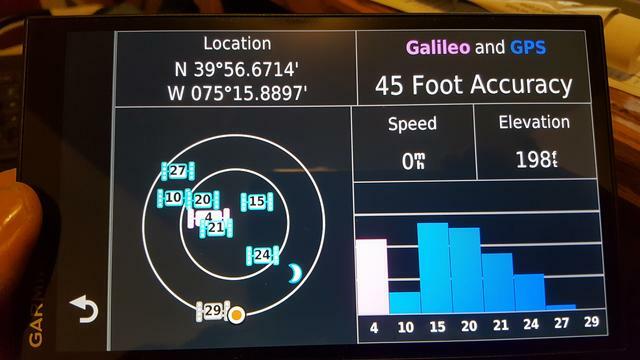 seeing Galileo and GPS displayed in different colors on my satellite screen. Galileo is in pink, GPS is in blue. So, the global display and bar graph display are both showing pink and blue birds !! I wish Garmin would fix the route calculation error issue on the nuvi 67lm with the new map. Support says it's a known issue but says the model is discontinued so I guess that means no more software updates..
Where are you seeing this? On a computer or the DriveSmart 61, and if so where on the GPS? Nevermind this too, I should use my friend Google before asking the question here. Only one Galileo showing here. Smartphone photo not liking the color pink. that's right, that's the view I see on mine I was referring to. This morning I'm seeing 5 Galileo satellites and 7 of the traditional craft. The "screen shot" I posted earlier was from inside my home, only one Galileo satellite. This afternoon I was in Philadelphia in my work truck and 7 now show up, along with 7 regular GPS satellites. a good number of them, too, while sitting inside. Tested, it is better than last version.